"Together we know everything, together we have everything"
For a quick introduction to the P2P Foundation see our new homepage. 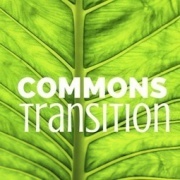 For an introduction to our worldview, see the Commons Transition Primer website. Watch this 20 min overview of our key proposals and introductory videos. 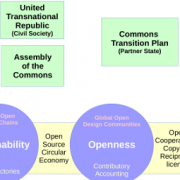 Introduction to the Commons Transition. Coming soon: On public-commons institutional design: The Commons Transition Plan for the City of Ghent. a. in capitalism there is a specific articulation of market/community (nation)/command (state) in which the market is dominant. b. a commons-centric economy has a different articulation in which the communal mechanisms of pooling shared resources are dominant. d. It is possible to develop a strategy for deepening and expanding the weight of the commons-based processes (transvestment, etc.). e. If sustained, such a strategy could ultimate erode the dominance of capitalism. * new! : check out our Multi-Category Search for Combined Category Searching ! Explanations here! and true: P2P Technological Infrastructures. English: Network Society and Future Scenarios for a Collaborative Economy. By Vasilis Kostakis and Michel Bauwens. Palgrave, 2014. French: Sauver le monde. Vers une société post-capitaliste avec le peer-to-peer. Par Michel Bauwens et Jean Lievens. Les Liens qui Liberent, 2015. Dutch: De wereld redden. Met peer-to-peer naar een postkapitalistische samenleving. Van Michel Bauwens en Jean Lievens. Houtekiet, 2013.
stream 2: recreating political voice and power, through bottom up Assemblies of the Commons and Chamber of the Commons that put forward social charters, AND through "top-down" progressive coalitions (through existing politics and parties) coalitions around the commons , i.e. 'the politics and policies of the commons', that continue our efforts to implement Commons Transition Plans. Here is a list of Country Categories. These categories list all pages that contain country relevant tags for example [[Category:Brazil]] will list all pages with the tag [[Category:Brazil]] in the wiki text. Categories and Pages are different. Categories are directory listings so we use country Pages for general information and discussion for example Brazil. 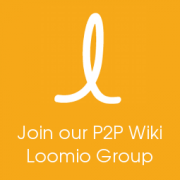 For a listing of all country Categories AND Pages and a quick guide on how you can help build a directory of P2P activities around the world see Country Category. We are a small organisation and need your support to maintain and update our knowledge commons. 35,496 content pages with 117808 total editions. This page was last modified on 14 January 2018, at 08:10. This page has been accessed 2,740,993 times.